As promised, here is the second review of this lovely (but hot) Friday. It's Pikmin 3 for the Wii U, and it's as great to play as it to look at. Plus, this review isn't some out-of-place commentary on Wii U sales, so that's a plus, too. Pikmin fans have been patiently waiting for the third installment of the series to arrive for a long time now. It's almost been a decade since Pikmin 2 came out on the Nintendo GameCube. As Shigeru Miyamoto once said, "A delayed game is eventually good, but a bad game is bad forever." That philosophy went into the development of Pikmin 3, having the game delayed multiple times throughout its creation. The final product is at last here and on the Wii U. 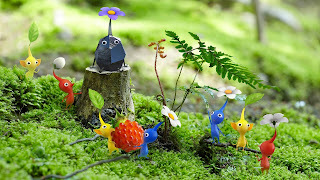 It is with pleasure I say that Pikmin 3 was well worth the wait. The planet Koppai is in desperate need of food, so they send off three different inhabitants of the planet, the Captain Charlie, his faithful partner Alph, and a botanist named Brittany to explore a mysterious planet they call PNF-404. However, the landing doesn't go as smoothly as they expected, and their ship crash lands, separating the three from one another. 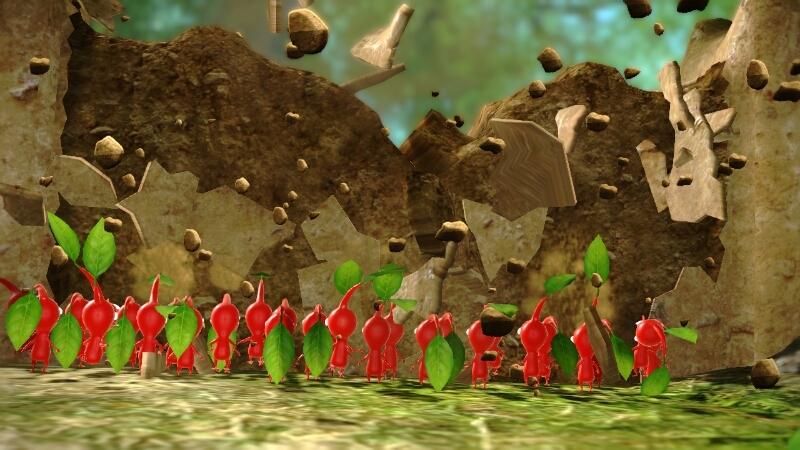 Eventually coming across a helpful group of plant-like creatures known as Pikmin, Alph and Brittany (who meet up early in the game) decide to use their new friendly army to carry the life-saving fruit that PNF-404 possesses while searching for Captain Charlie. There are five unique Pikmin types in Pikmin 3, and they join Alph, Brittany, and Charlie's side as the game progresses. 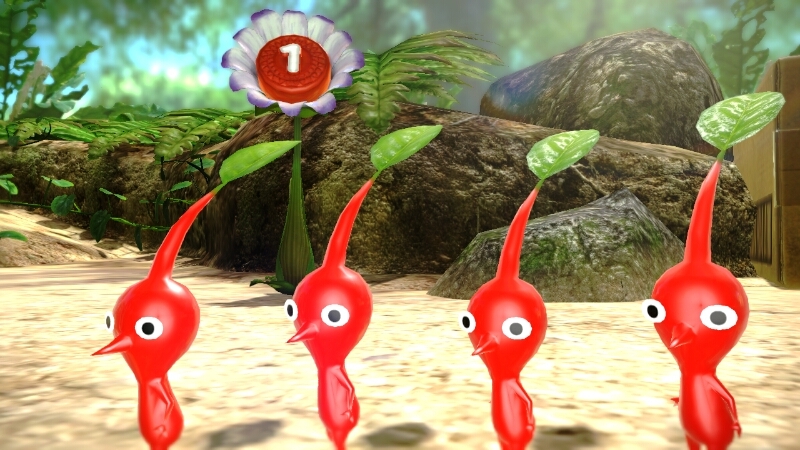 Red Pikmin are resistant to fire and are excellent fighters, taking off the most damage when working together on a creature. 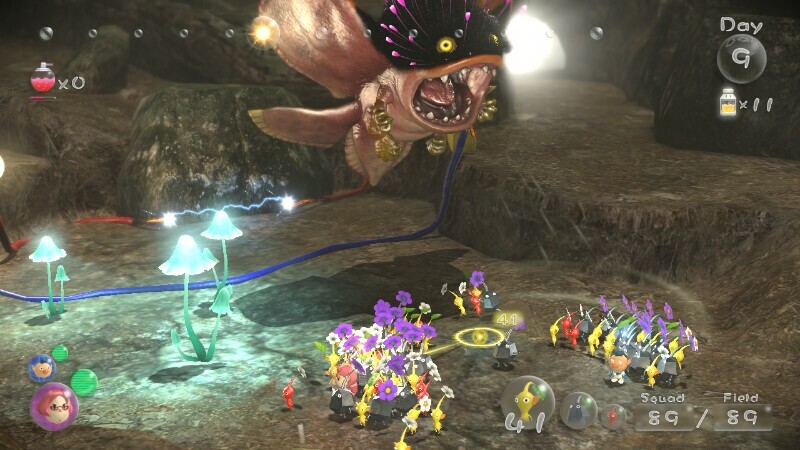 Yellow Pikmin are immune to electricity, can be thrown higher than other Pikmin, and can be used as a conduit to turn on the lights in dark caverns. The group of Pikmin that joins the three PNF-404 explorers are the Blue Pikmin. These Pikmin can move underwater and need not fear drowning. 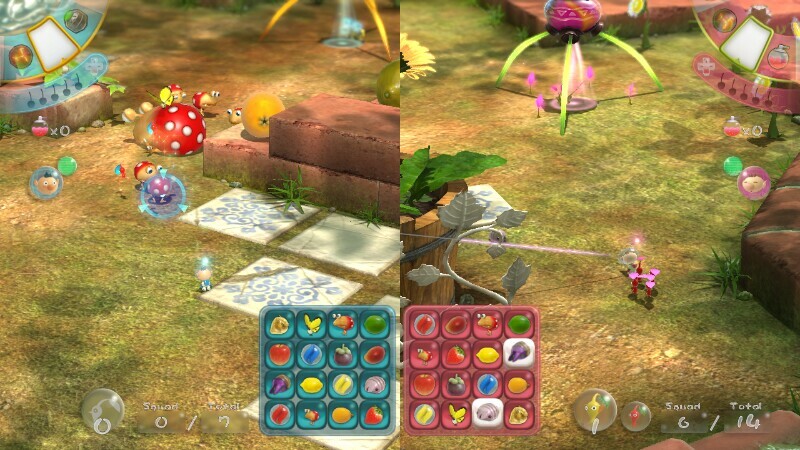 There are two new types of Pikmin that join the ensemble, Rock and Flying Pikmin. 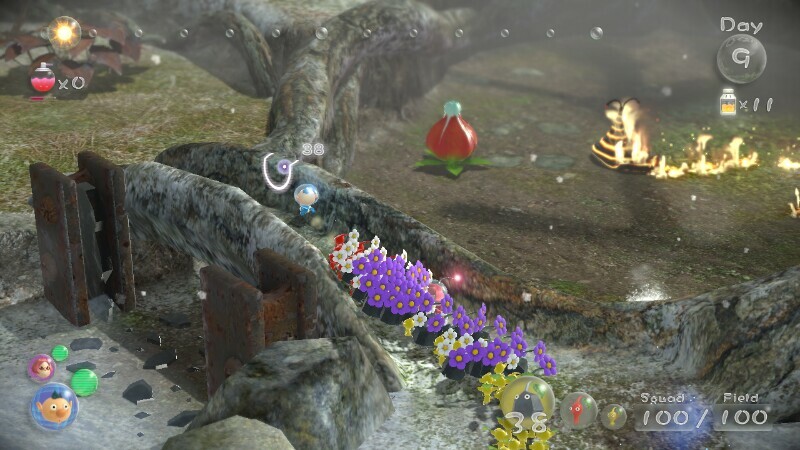 While Rock Pikmin are great at taking down crystallized objects and enemies, Flying Pikmin are great at taking down airborne enemies and can fly over bodies of water. Yellow Pikmin are also the fastest diggers. They could be great archaeologists! You'll need those different types of Pikmin, too. The bountiful amounts of fruit that lay about in the various areas of Pikmin 3 cannot be carried by Alph, Brittany or Charlie. Instead, they need to be carried back to the ship by Pikmin. At the end of each day, the fruit that is picked up is juiced and is turned into rations for the Koppai crew. If there is no juice left at the end of a day, it is game over. However, it's very easy to find fruit-- especially when an upgrade is given, allowing players to see where hidden fruit is located on each map-- so this danger doesn't really show itself as a serious threat that often. Besides fruit, Pikmin can carry back pellets and enemy carcasses to spawn more Pikmin to command! 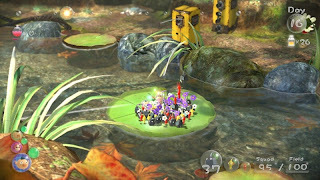 Time management is key in Pikmin 3, as each day is timed and only allows for around fifteen minutes of exploration. When it turns dark, and if there are Pikmin that are idle (i.e. not near the starting point of an area or with one of the three Koppai denizens), they will be eaten as night falls. It's all about maximizing your days to be as efficient as possible to get the most done. Part of the fun of Pikmin 3 is seeing how much work you can get done in a single day, and to see how many days it takes you to beat the game. 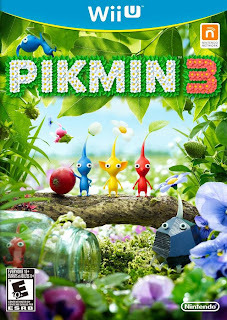 Pikmin 3 is the type of title that you want to play through more than once, just to see how much faster you can complete the game, and with as few Pikmin deaths as possible. Split up your duties for maximum efficiency. To help with efficiency, Alph, Brittany and Charlie can be separated at any time. With a press of a button, characters can be switched between, each containing their own horde of Pikmin. Of course, the same rule of past Pikmin games that only 100 Pikmin total can be on a map at the same time still exists with this third iteration. Using the map and assigning Alph, Brittany or Charlie to destinations with the "go here" command, allows the characters to move automatically to a given location without input from the player. Just be sure there's no hazards or creatures in their planned path. 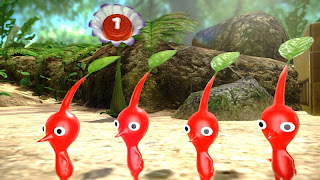 Thankfully, a character in trouble will announce his or her danger to the player so they can quickly switch to that character's Pikmin party. And the wall comes tumbling down. 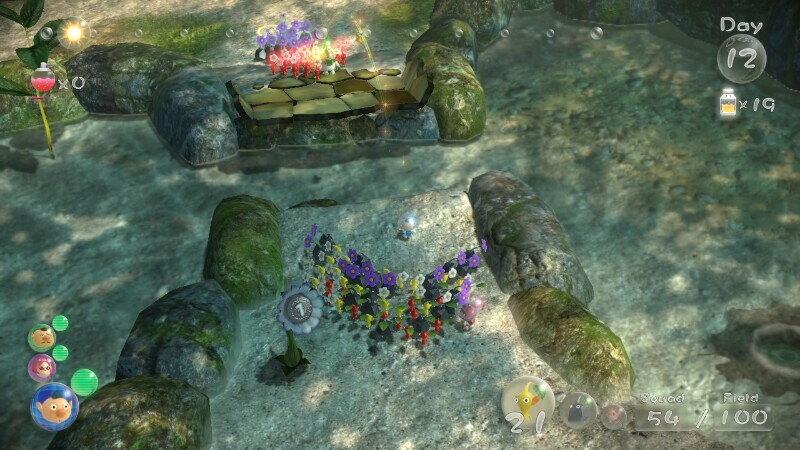 At first, I wasn't very effective with my Pikmin army. I generally kept them all together in one group for fear of losing wayward Pikmin. However, as the game continued and I picked up new strategies, I was more comfortable multitasking. For instance, while Alph's Pikmin posse worked on destroying a dirt wall to the north, I had Brittany's Pikmin party taking out enemies to clear the way for Charlie's Pikmin group to carry a fruit back to the ship. By that time, Alph's group had finished off working on the dirt wall for us to make progress with all three Pikmin parties. Learning how to maximize the efforts between all three characters is really rewarding. While one group uses fragments to build a bridge, another can be working on destroying an electrical wall on the opposite side of the map. The three Koppai companions can toss one another across gaps and to higher land to venture through otherwise inaccessible areas. This adds even more to the immense exploration in the game. of the map to help her out. There are plenty of dangerous creatures that would love nothing more than to gobble down the delicious-looking Pikmin they spot. Thankfully, Alph, Brittany and Charlie have strength in numbers. Taking on a bulborb creature with one Pikmin is pretty much suicide for that unfortunate Pikmin. Instead, you can move behind the enemy, and either toss multiple Pikmin on its back or lock on to the target and have all of your Pikmin charge the foe, making short work of it. 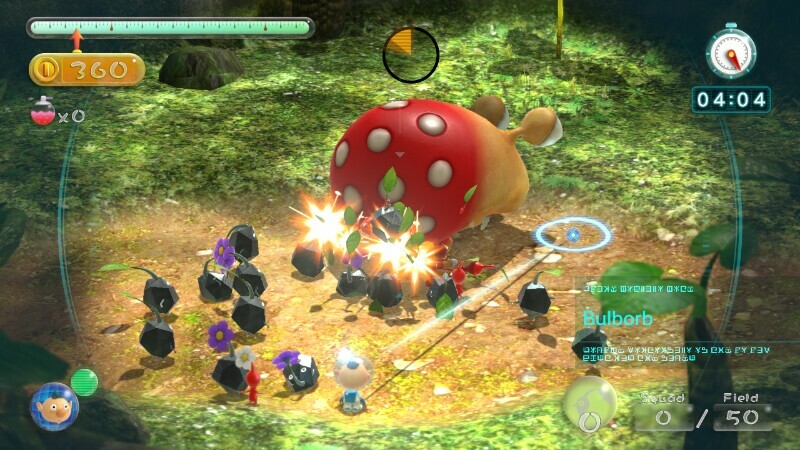 With some enemies it's wise to take them out with one specific Pikmin type, such as an electrified enemy, while some just require some brute force. Learning the best way to take down a creature is paramount in the world of Pikmin 3. Lock on and beat down. Along the Pokkai inhabitants' journey, they will come across several bosses that must be dealt with. These encounters are some of the most fun in series history. Each demands the player to experiment with using their different Pikmin types to come up with the best strategy to take down the creature in question. For instance, the first boss, an armored centipede of sorts is invulnerable while it has its shell on. Thankfully, that shell is made of crystal, perfect for Rock Pikmin to smash. 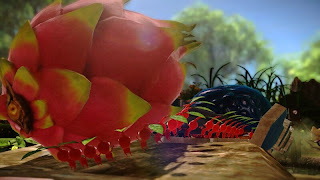 Once its flesh has been exposed, the player can toss Red Pikmin on the boss to wither its health down. A defeated boss usually opens the way to an entirely new area. One benefit of Pikmin 3 is that if you run out of daylight during a boss encounter, when you return to the fight the next day, the boss will still be at the same amount of health it was at the day before. This is a wonderful addition to the series that makes for less headaches. 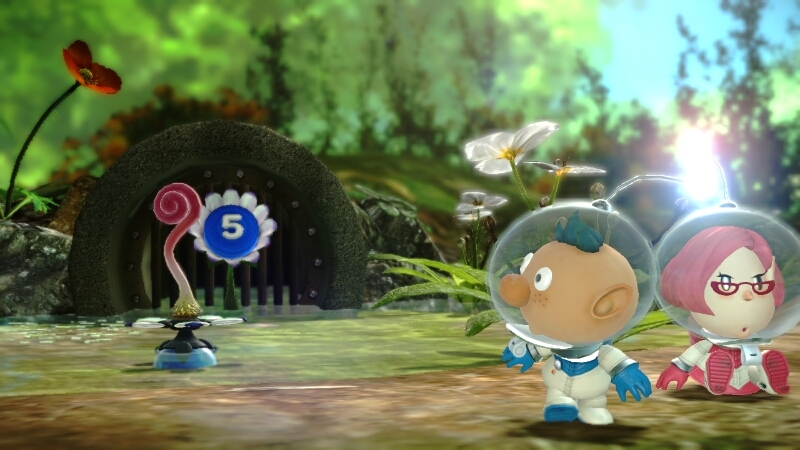 Speaking of areas, Pikmin 3 possesses five to fully explore. While that number might not seem like a lot, these different areas of the game are much larger than what was seen in past Pikmin titles. They contain multiple secrets, pathways, challenges, puzzles, and fruit to obtain. Alph, Brittany and Charlie will visit tropical jungles, icy tundras, autumn woods, and grassy plains in their search for fruit. There are even areas that can't be reached through normal means. Twilight River is a gorgeous location. 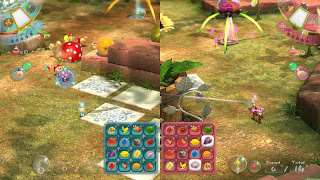 As for the controls of Pikmin 3, there are multiple options to play, such as solely with the Wii U GamePad, one has you using the Pro Controller, or you can use the combination of the Wii Remote and Nunchuk, a style that should be familiar to those who played the New Play Control versions of Pikmin 1 and 2 on the Wii. This latter control setup was the one I used. In conjunction with the Wii Remote and Nunchuk, I used the Wii U GamePad's screen as my map. This combination made assigning orders, seeing where straggling Pikmin were, and knowing where to go all the easier and more convenient. With the Wii Remote, you can point to where you wish to throw Pikmin for a much more precise experience. Meanwhile, the Wii U GamePad and Pro Controller controls aren't exactly like the GameCube versions. The second stick actually does camera movement this time around instead of circling your Pikmin around your current character. Instead, you have to hold a shoulder button while using the left analog stick to aim where to throw your Pikmin. This is confusing at first, but once you're accustomed to this new control setup, it will become second nature. It just won't replace the near perfection and ease of use of using the Wii Remote and Nunchuk. Still, there's a problem with needing to babysit straggling Pikmin regardless of which control setup you use. Get too far ahead of Pikmin, and they will walk into walls, becoming idle. This can get annoying tracking down stragglers only because it takes time away from doing other, more important tasks. Depending on how fast you are and how efficient your day-planning is in Pikmin 3, the total time it will take to beat the game will vary. For me, it took 42 game days and around 17 hours of gameplay time. The nice thing about days is that you can restart them mid-day, and you can even choose to go back to previous days. Of course, if you save, the events that occurred during the subsequent days will be like they never happened, so do be careful. Alongside the single player story mode, there are two other modes to enjoy. The first is Challenge mode, where one or two players can try out different missions on five specially-made maps. The goals are either to collect as much treasure as possible, defeat as many enemies as possible, or to defeat a boss as quickly as possible. Best scores are shared via the internet so players can see where they stack up against the world. The other mode is for two players and is a competitive one, Bingo Battle. Available in twelve unique maps (each needing to be unlocked by playing the previous one), Bingo Battle tasks each player with defeating enemies or taking treasure to fill squares on their bingo sheet. Get four filled-in squares in any direction and you are the winner. The only unfortunate part about Bingo Battle is that there is no online multiplayer, something that would have been perfect and not system-demanding for players around the world to enjoy this mode. As it stands, you can only enjoy Bingo Battle locally, which a darn shame. Pikmin and Bingo? A match made in heaven. 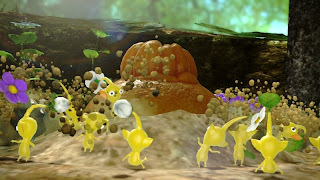 Pikmin 3 uses a lot of visual effects to make an overall excellent looking game. The shimmer of water is very impressive, the lighting effects and reflections off objects and characters is tremendous, and the ability to have 100 different Pikmin moving on screen at the same time without any slowdown is nothing short of incredible. Using the KopPad, picked up early within the game, players can even take first-person shots in-game. This is a sensationally addicting feature, allowing players to post their pics on Miiverse. Of course, being in first-person it's easy to notice that the ground textures aren't that hot. Still, when you're normally playing the game with a zoomed out camera angle, they aren't an issue visually at all. Meanwhile, the music is suitably ambient and works well, featuring subdued instrumentation and melodies. Ultimately, Pikmin 3 is a fantastic title to look at, and it shows that the Wii U can indeed push some impressive graphics. Use the KopPad to create some lovely shots. It's safe to say, to me, Pikmin 3 is the best entry in the series yet. The original Pikmin was too short, while Pikmin 2 was too overwhelming at times. Pikmin 3 strikes a nice balance between the two extremes, making for a game that many will probably want to play through more than once. The addition of three team members to split up responsibilities means that players can experiment and use different strategies to get the most out of each day. Losing Pikmin is just an inconvenience, but somehow you truly feel bad when you lose even one, much more half your army to one enemy attack. Pikmin 3 is another Miyamoto masterpiece that's not quite perfect, but it certainly comes close.